This chart features data gathered from the American Community Survey 2010–14, 5-year Public Use Microdata Sample (PUMS). It includes individuals who stated they were in full-time employment, between the ages of 25 and 64, had achieved a bachelor’s degree or higher, and had either history or US history as the field of study for their bachelor’s degree. What Can History Majors Do? Employment prospects: History majors’ versatile skillsets prepare them for a wide variety of occupations and gainful employment. Nationally, history majors who obtain bachelor’s degrees find employment in vastly diverse fields (Portland State University). Data provided from the American Community Survey (ACS) indicates that history majors find employment soon after graduation (Sturtevant). 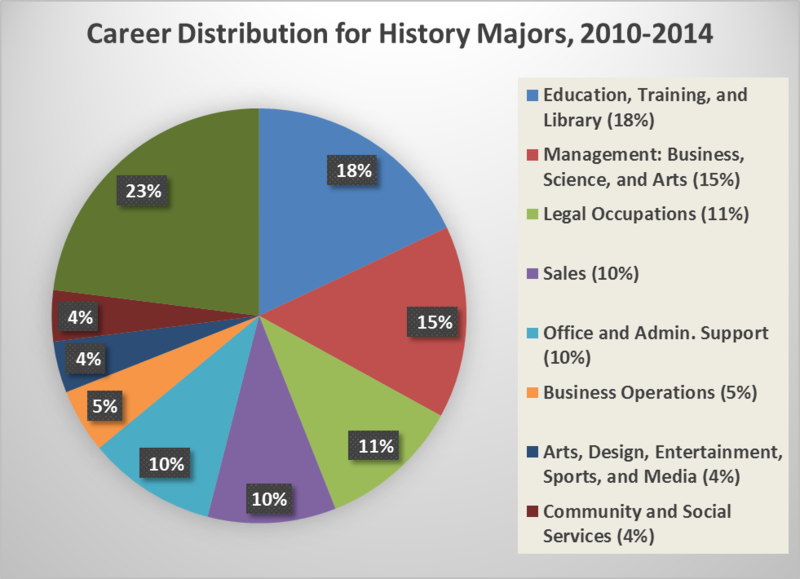 Although the majority of history majors do not become professional historians after graduation, they secure worthwhile employment in many other fields. Compared with the national unemployment average of 7.7 percent, only 4.1 percent of history degree-holders ages 25-64 reported unemployment in the ACS (Sturtevant). What makes them valuable? The coursework assigned to history students helps them develop skills that are useful to employers. The skills that students learn from studying history include communicating, collaborating, decision-making, problem-solving, planning, organizing, accessing information, researching, analyzing quantitative data, operating technical and computer software, writing, editing, reporting, presenting, selling, and influencing (Collins). How can they secure desirable work? When history majors seek out worthwhile employment, they should plan to take active rather than passive roles. History majors must explore desirable occupations, identify promising employers, reach out to them before others do, and market their relevant skills and achievements (Collins). Searching out rather than waiting for employment is especially important considering that only about 20 percent of all job openings are advertised (Collins). To seize on opportunities that are not always obvious, history graduates must research, target ideal employers, and market themselves based on their skills and experiences. Portland State University, What Can I do With a Degree in History?